So this week was purple. One thing I've learned this week is that our room is not big on purple items. Our color box was very empty this week--and believe me I was searching. One thing I try to do when doing purple is allow them to have purple and blue next to each other. I find they confuse these two colors very often. So we did a sorting activity with blue and purple bears. 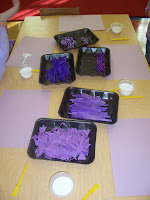 Then we also did Play Doh mixing and that helped them to see that blue is used to make purple. They love the Play Doh mixing--we mixed the red and the blue so now we have purple Play Doh. For our color books we gave Ernie purple grapes. I have a picture of Ernie holding grapes and they have to glue purple ovals down to make his grapes purple. 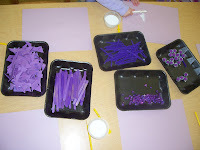 Today we created some beautiful purple creations with lots of odds and ends that I found in the closet. 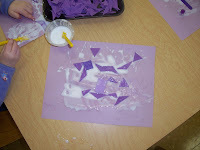 Plus we used lots and lots of glue. Hopefully these will be dry by Tuesday. I'm not sure if the table will be clear of glue by the end of the year. I tried. They had a great time with this though. It was totally an individual project just letting them explore. For some of them just having fun spreading the glue was the major attraction. 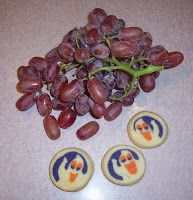 Our snack today was Halloween cookies with some purple in them, along with purple grapes. I know they are actually called red grapes, but they look purple enough to me. The real purple grapes look more black, and they have seeds. Even our leader brought some snack with purple--we had colored goldfish that included purple and purple juice. Boy were we full when snack was done.